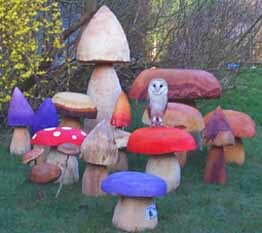 with our range of English hardwood mushrooms & toadstools and Faeries. Press Ctrl + D now! and add this site to your favourites folder. Deep in the heart of the Shropshire countryside, in an area of outstanding natural beauty and rich in folklore and fables. Lies the village of Little Stretton, which is just south of the Roman market town of Church Stretton. It is here, that Sue Stickley, a professional artist, uses her artistic abilities to create superior and realistic carvings from local hardwood. Her designs will enhance anyone's garden/patio and be the envy of friends and family alike. Each mushroom or toadstool, is carved from the heart of a solid hardwood log using a chainsaw. Please don't attempt this at home without the necessary safety equipment, especially the specialised trousers, as leg amputation is a major threat! All wood used is derived from local tree surgeons, to ensure that all of the carvings are conservation and environmentally friendly. Contents are copyright of The Magic Mushroom Co. Excellent gift idea for the person who has everything! And don't forget to check out our new faerie page!